The style of Chesterfield furniture originated in Britain the 1900s, when the term Chesterfield was actually used to describe any kind of sofa. This is because the first Chesterfield sofa was commissioned by the Earl of Chesterfield in the 18th century. The deep buttoned leather upholstery is now widely recognised across the world and is regarded as a classic, luxury item of furniture that no home should be without. 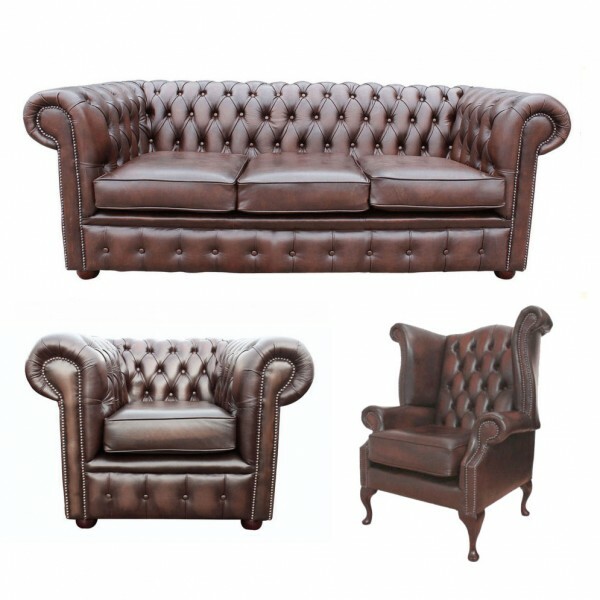 At Zest Interiors we are proud to uphold this British tradition and offer a selection of genuine leather Chesterfield sofas and chairs that are reminiscent of the antique style of yesteryear. Each genuine Chesterfield sofa and chair is hand crafted with solid wood frames for strength and longevity and upholstered in the finest quality leather and components to provide you and your family with a stunning timeless sofa that you’ll continue to love for years. Our genuine leather Chesterfield sofas and chairs are designed with serious comfort in mind. The spacious seats make sprawling out in front of the TV completely comfortable, though you’ll have to move up to make room for your family and friends! Each leather Chesterfield chair and sofa is finished for a smooth, sheer look which enhances the appearance of the leather and reinforces the antique style. When shopping for genuine Chesterfield sofas and chairs we have a variety of options available to you. Each 2 seater, 3 seater, sofa bed, Chesterfield Queen Anne and Chesterfield Club chair is available in oxblood red, blue, green, black or antique brown colours – meaning you can choose the perfect genuine Chesterfield furniture to suit your home. Call into our Showroom and browse our leather Chesterfield chairs and sofas for yourself, or browse our website to see our complete collection. Please call our Sales Hotline with any questions or for more information. 0 Comments To "Genuine Leather Chesterfield Furniture"